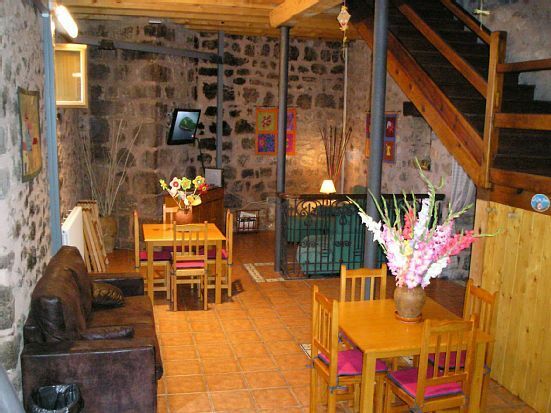 It is an ideal place to rest and since La Rioja is a small community, La Casa Nueva is ideal for enjoying the different excursions and activities that this community offers. Framed within the tourist lodgings of La Rioja, it guarantees the quality and compliance with the rules established for your safety and comfort during your stay. The house is rented by rooms or complete, see our website The new house in Nieva de cameros. You can thus plan your holidays as a family or for groups. It has a living room with TV and DVD, industrial type kitchen, bathrooms with communal showers and 7 rooms 3 OF THEM with private bathroom. • Surrounds the house with a green area of more than 1000 m and in the structure of the house, among other things, highlights a large wooden roof and thick stone walls. At the entrance there is a stone arch over two centuries old that welcomes us and introduces us to the typical interior in our town houses.
. The furniture is in solid pine which gives it a warm and pleasant atmosphere. Both mattresses and bases are quality for an optimal rest. They are spacious and comfortably distributed. All rooms are exterior with views of the village and the mountain which makes them very bright and cheerful. Although the area is extremely quiet the windows with insulating glass avoid any noise that may come from outside as well as maintaining the temperature of the house. The interior facilities are cozy and spacious. The living room has a large area for different activities. Its careful decoration is full of details that give it that warmth that makes you feel at home. The kitchen, fully equipped with all industrial type appliances. For rent by rooms payment on departure. For rent for groups payment on arrival and return of the deposit upon departure. As it is a tourist lodge and in the groups mode, it has a rental of towels and sheets or you can bring them, if you come with a sleeping bag you will need at least Bottom sheet 90 and and pillow case. Hemos estado este fin de semana un grupo de 15 personas en el albergue y todo a estado estupendo, buena comida, buen albergue y buen trato. El pueblo y la comarca son especiales. Es nuestra segunda visita a la casa y esta estupendamente, mas que un albergue parece una casa rural, ademas el trato de Ana es realmente agradable. Este año fuimos con mas amigos. Se preocupa de darnos toda la información de la zona. Y la comida esta muy rica tipica Camerana. Estupenda casa ideal para viajar en grupo o en familia con niños. Muy recomendable para los amantes de triscar montañas y hacer grandes recorridos.